He's methodical, sinister, and calculating, but the killer in The Basement may have met his match with his eighth would-be victim, and you can watch the blood-smeared chess match between the two characters when the new horror film from Brian Conley and Nathan Ives makes its world premiere at Hollywood's Shriekfest Film Festival this October. To help hold you over until then, we've been provided with two exclusive stills to share with Daily Dead readers. 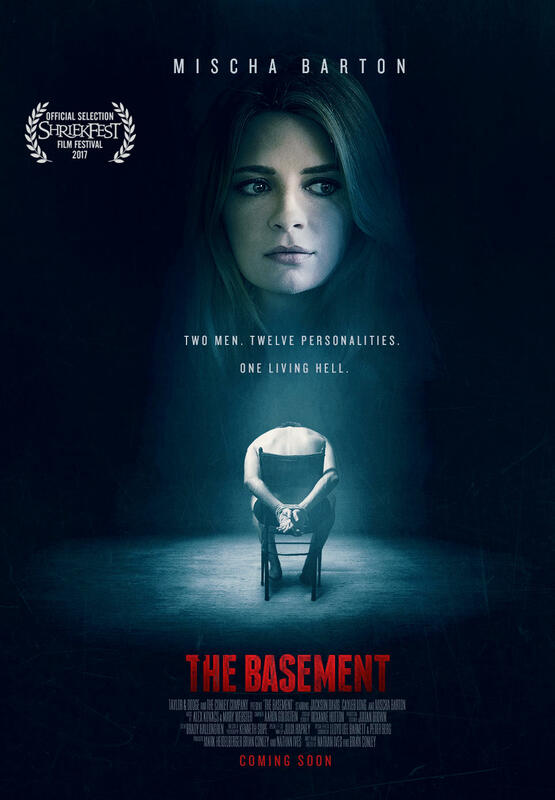 You can view our two exclusive stills below, along with the official poster for The Basement, co-starring Mischa Barton. We also have the official press release with full details on the film's world premiere at Shriekfest, and you can check here if you're interested in learning more about getting tickets for the screening. To learn more about The Basement, visit Twitter, Facebook, Instagram, and the film's official website. Press Release: LOS ANGELES, CA (SEPTEMBER 14, 2017) – Pasadena, California-based production company Conley Entertainment Group is proud to announce the World Premiere of their feature independent horror/thriller ‘The Basement,’ to be held at the venerable Shriekfest Film Festival on Saturday, October 7th at 8:15PM at Raleigh Studios (5300 Melrose Avenue), in Hollywood, CA. Starring Mischa Barton (‘The Sixth Sense’), Jackson Davis (‘Lonelygirl15’), Cayleb Long, Tracie Thoms (‘Death Proof’), Bailey Anne Borders (‘The Fifth Wave’) and Sarah Nicklin, the plot of ‘The Basement,‘ which Sam Santiago of TrulyDisturbing.com likens to a cross between ‘Silence of the Lambs’ and ‘Split,’ is about a L.A. serial killer known as The Gemini (Davis), who tortures and ultimately murders his victims in the dungeon-like basement of his San Fernando Valley home. By the time the movie opens, Gemini has already claimed seven victims, all of whom he has horrifyingly maimed and decapitated with a blowtorch, but Craig Owen (Long), the famed musician who Gemini has chosen for his eighth victim, and Craig’s beautiful wife Kelly (Barton) prove every bit the killer’s equal in the art of psychological warfare, giving rise to one of the more diabolical plot twists in recent memory. Stated Shriekfest Founder Denise Gossett of the film’s selection, “"I am a huge fan and supporter of independent films and ‘The Basement’ is a great example of a well-made, beautifully shot film with some terrific performances!" Worldwide distribution rights for ‘The Basement’ are currently available.